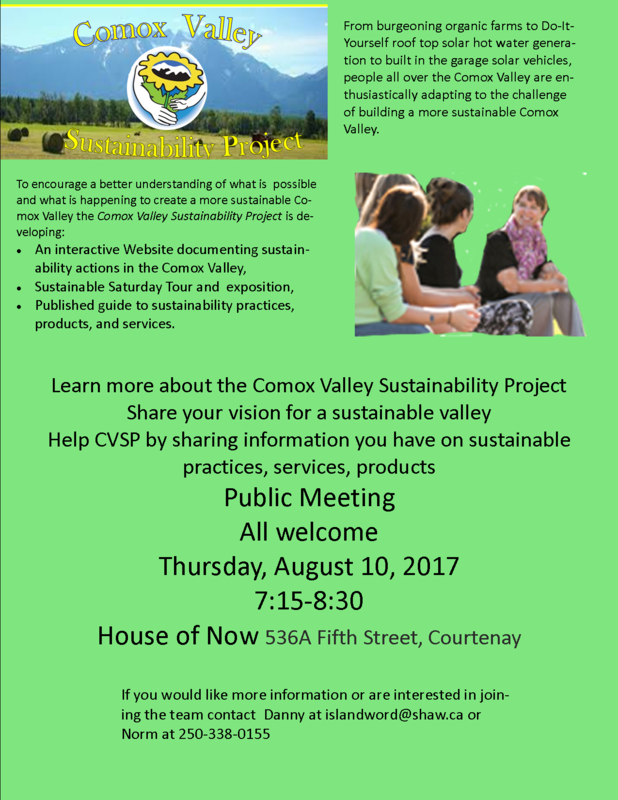 Public Meeting Aug 10 for New Sustainability Project. From burgeoning organic farms to Do-It-Yourself rooftop solar hot water generation, to built-in-the-garage solar vehicles, people all over the Comox Valley are enthusiastically adapting to the challenge of moving towards sustainability. A published guide to sustainability practices, products, and services. 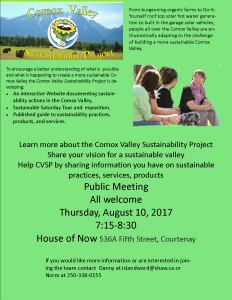 You are warmly invited to come and learn more about the Comox Valley Sustainability Project, and share your information on sustainable practices, services and products at the Sustainability Project Public Meeting on Thursday, August 10, 2017, 7:15-8:30 at House of Now 536A Fifth Street, Courtenay. For more information or are interested in joining the team contact Danny at islandword@shaw.ca or Norm at 250-338-0155.